Polar White 12 volt Motor Kit for Fiamma F45S awnings. 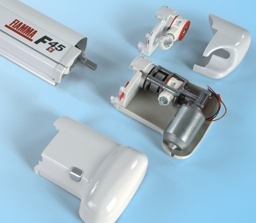 Exclusive: Only Fiamma offers you the Motor Kit 12V DC accessory that can be installed on your awning. The Motor Kit also allows manual opening and closing operation. The standard motor kit extends the total length of the awning case about 13cm. Includes control panel with switch. Fits F45S awnings. Not for standard F45 awnings.